Establishing and maintaining quality control systems can be expensive for small businesses and business units. Argent understood that and achieved all the necessary ISO standards required in their industry. However, as time went buy, the engineers and technicians at Argent decided there had to be a better way to go about this. Q provides you assurance that your business is quality driven. Q produces a structure to manage business quality efficiently and cost-effectively. Q allows your business to scale with real-time reporting, metrics and continuous improvement actions. 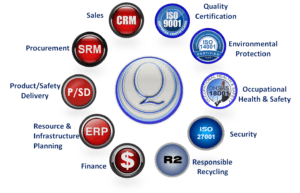 Q-Portal meets the requirements for ISO9000, ISO14001, ISO27001, OSHA18001, & R2. By eliminating the Quality/Business gap, we allow the business to continuously improve in real-time. The subscription service has saved our clients hundreds of thousands of dollars on implementation, standardization and reporting fees.